Review: Charge by Motionhouse. Nottingham Playhouse. – East Midlands Theatre. 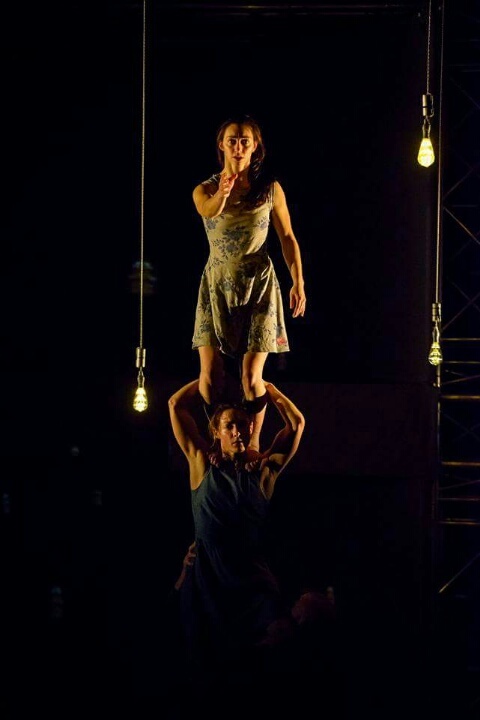 Review: Charge by Motionhouse. Nottingham Playhouse. 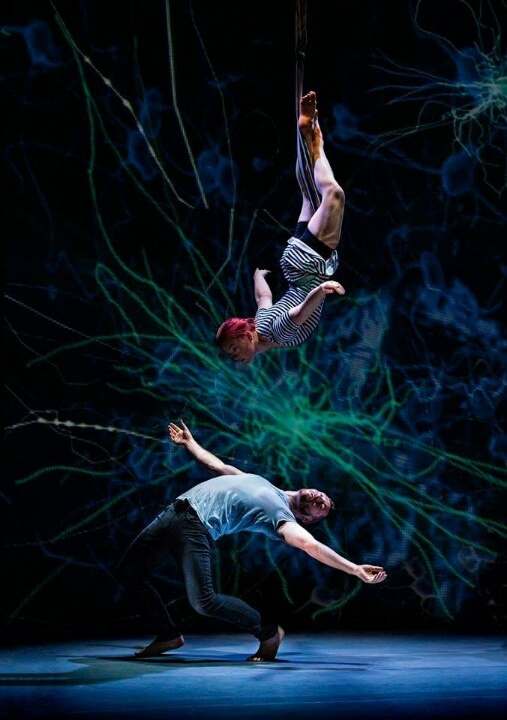 Charge by Motionhouse is an astonishing multi-media dance show that fuses science, digital projection, sound and light to create a thrilling and explosive spectacle. It is breath-taking in its ambition and jaw-dropping in the athleticism and grace of its dancers. 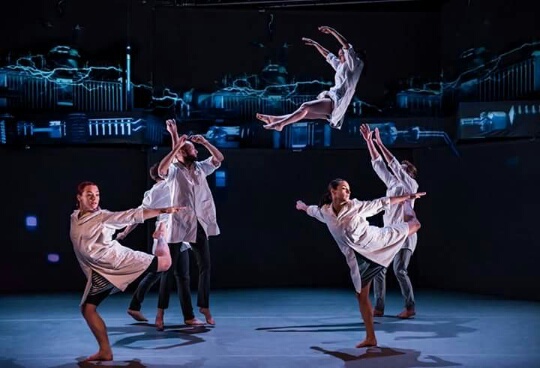 Kevin Finnan MBE, Director and Choreographer, worked with Professor Frances Ashcroft from Oxford University, to develop a language that could express the role of electricity in the human body and in our lives. Charge is the third element of a triptych of work by Motionhouse, Earth Trilogy which included Scattered (2009) and Broken (2013). The performance takes the audience on a journey from the electrical charge that sparks human life through our everyday lives and memories, to the mundane use of electric as an everyday commodity in today’s world. Digital projections are used cleverly to switch between the internal synapses and visceral connections of the body to representations of the busy urban landscape, the windows of skyscrapers echoing the body’s impulses. The integration of the visuals with the dance is absolute and so, so clever. The original music and soundscape work hand in hand with the movement and visuals to create ebb and flow. A thrumming cello provides an insistent heartbeat, elegant strings express the humanity of the piece while electronic music and digitised sounds are used to indicate the more analytic, scientific based connections and urban scenes. The themes are sometimes abstract, sometimes more obvious, showing cause and effect, and connectivity through flesh and blood, everyday ritual, relationships and work. The set for Charge is deceptively simple. Simon Dornan, Designer, describes its function as being threefold – to provide a surface for projections, a ‘place’ for the dancers to inhabit and to allow for extensions of height and movement. This is entirely disingenuous; it is a landscape, a 3D playground, daring, adventurous and constantly morphing, changing, providing surprises. 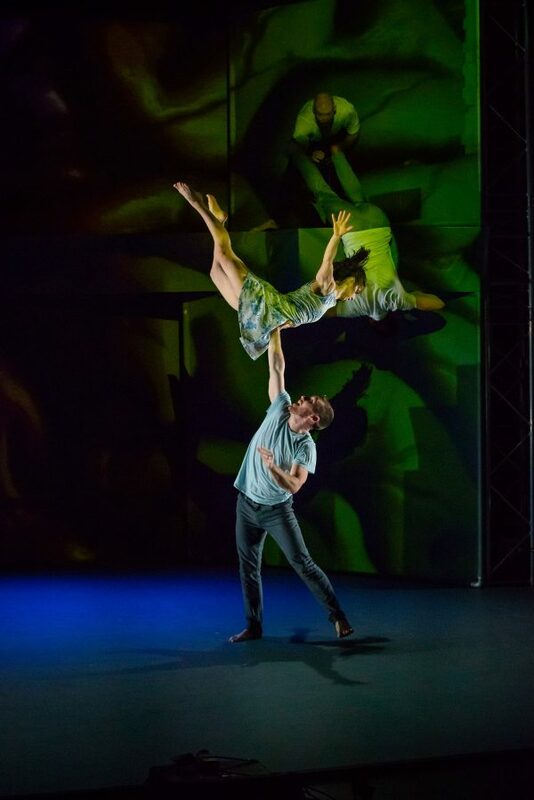 The lighting by Natasha Chivers is a tour de force, working beat by beat with the dancers to incredible effect; it adds a further dimension to something which already feels like it is breaking all constraints on time and place. There is all of this, and then there are the dancers themselves, Junior Cunningham, Chris Knight, Daniel Massarella, Alasdair Stewart, Martina Knight, Beth Pattison, Naomi Tadevossian, and Rebecca Williams. Their strength and grace is sublime, strong as oxen and yet with subtle and detailed expression. The movement is non-stop, a blur of pulsating, ricocheting bullets of energy, the electrical impulse driving them ceaselessly onwards. The boundaries of dance and circus skills are invisible as one melds seamlessly into the other, skilfully using these elements to tell the story in unique ways. There is nothing that is predictable, from group presentations to intricate duet work, hand to hand acrobatics and more ‘traditional’ contemporary dance. It is impossible to imagine how long it took to create this complex and demanding choreography. A truly exhilarating and unique production. Motionhouse is on tour in the UK. See Motionhouse Tours link for Charge and other touring productions. For more information on how Charge was made click HERE. Promo: Carlton Operatic’s forthcoming production of Top Hat. Promo: Curve Theatre. Northern Ballet’s The Little Mermaid.